Choose from four lovely designs from designer Tammy Tadd and celebrate the beauty of nature with your own market fresh quilt. 2 designs use fat quarters and all have rich vivid colors. 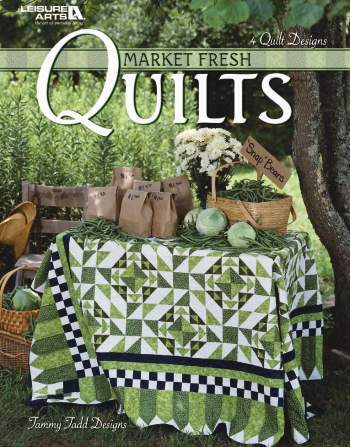 Designs include 'Snapin' Green Beans', pastel 'Peaches & Cream', 'My Big Fat Quarter Quilt', and 'My Little Fat Quarter Quilt. All lovely designs perfect for Summer or any time of the year! 44-page soft-cover stapled booklet.